A native of Niagara Falls, Eddie Mulligan has enjoyed a prolific career in sport that has spanned more than three decades. In 1946, Eddie played for the Terminal Coffee Shop Intermediate "A" Baseball Team who were Ontario Finalists that year. In 1949, now playing with the Fords Senior "A" squad, he captured an Ontario Championship. Equally adept on the ice as he was in the ball park, Eddie had an outstanding hockey career. Eddie enjoyed two seasons with the Niagara Falls Juniors who were League Champs and Ontario Finalists in 1944. 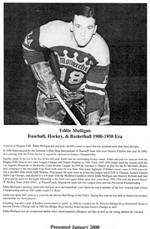 From 1947 -1950, Eddie spent his winters with the Los Angeles Monarchs of the Pacific Coast Hockey League. In 1950, he returned to Ontario to play for the St. Michael's Majors who competed in the Alexander Cup finals both years he was there. One major highlight of Eddie's career came in 1952 when he was a member of the Smith Falls Rideaus. That season the team went on to become League and E.O.H.A. Champs, Eastern Canada Allen Cup Champs, and played to a 6-6 draw with the Montreal Canadiens where Eddie Mulligan and Maurice Richard both had a goal and an assist on the night. 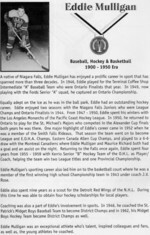 Returning to the Falls once again, Eddie spent four years from 1955 -1959 with Kerrio Senior "B" Hockey Team of the O.H.L. as Player/ Coach, helping the team win two League titles and one Provincial Championship. Eddie Mulligan's sporting career also led him on to the basketball court where he was a member of the first winning high school Championship team in 1943 under coach J. V. Rose. Eddie also spent nine years as a scout for the Detroit Red Wings of the N.H.L. During this time he was able to obtain four hockey scholarships for local players. Coaching was also a part of Eddie's involvement in sports. In 1946, he coached the St. Patrick's Midget Boys Baseball Team to become District Champs and in 1962, his Midget Boys Hockey Team became District Champs as well. Eddie Mulligan was an exceptional athlete who's talent, inspired colleagues and fans, as well as, the young athletes he coached.